FM Delisle Warner aces Bajan Field!! What a finalé!! Approximately 100 players from around the world logged into the Internet Chess Club (ICC) to watch the Board #1 matchup of the Barbados Championship. This battle pitted FMs Delisle Warner (pictured right) and Dr. Philip Corbin against each other in a script that could not have been written any better. Warner had waltzed through the field with an amazing 10-0 score while Corbin's only loss after ten rounds was to rising star, Askari Elson. Elson won the battle for 3rd place by grinding down Othneil Harewood to finish with 7½-3½ after a slow start. While the Barbadian ("Bajan") Championship was missing one of its marquee players in IM Kevin Denny, the top two seeds sliced through the field with inspired play. Warner, whose style is described as positional, has won the National Championship on one other occasion, but 7-time champion tactician Corbin stayed on his heels waiting for him to slip. That moment never happened and the showdown ensued. Reminiscent of the Tal-Korchnoi battles (where Korchnoi dominated), Warner had gotten the best of Corbin in the previous five matches, yielding only ½-point, but Corbin had already earned a reputation of being "The Stopper" as he had previously stopped Denny and FM Ron Buckmire from winning with perfect scores in previous championships. With a certainty, both players saw the pending matchup taking shape and had begun home preparation. The game was an exciting one and had "live" coverage on the Barbados Chess Federation's website, The Chess Drum and the ICC. Dr. Kumar Areti was handling the relay duties with the help of his son Muralidhar; Dr. Daaim Shabazz provided commentary at The Chess Drum; Andy "Zek" MacFarland manned the ICC board with help from relayers "Megasalud" and "CompFirePower." 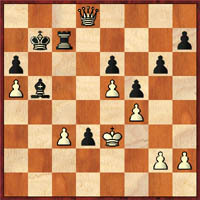 In Corbin-Warner, the game jumped off to an exciting start when Corbin sacrificed a pawn for pressure and the game took many perilous turns. Warner won a thrilling battle when Corbin lost on time in what was probably a drawn position. Nevertheless both players showed courage and fighting spirit down to the last move. The exciting battle that was enjoyed by all. 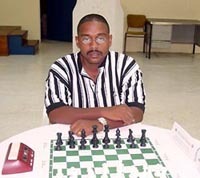 Congratulations to FM Warner and the Barbados Chess Federation!